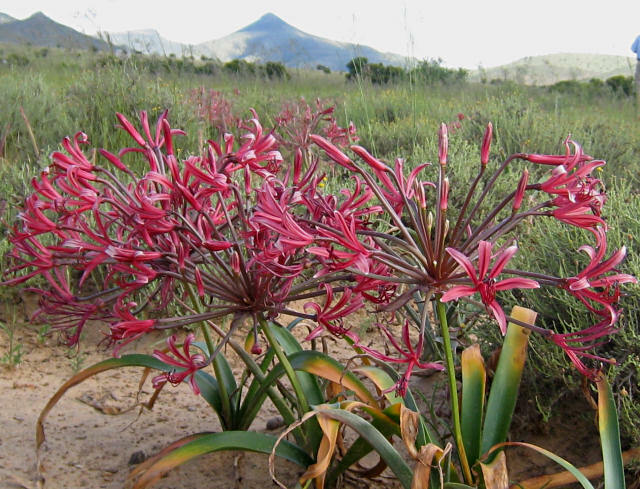 Nerine is a genus of 24 species in the family Amaryllidaceae 20 of which are endemic to the geographic areas of South Africa, Lesotho and Swaziland. The other 4 occur throughout southern Africa. Only 4 species are winter growing and 20 are summer growing, a subset of which are evergreen. 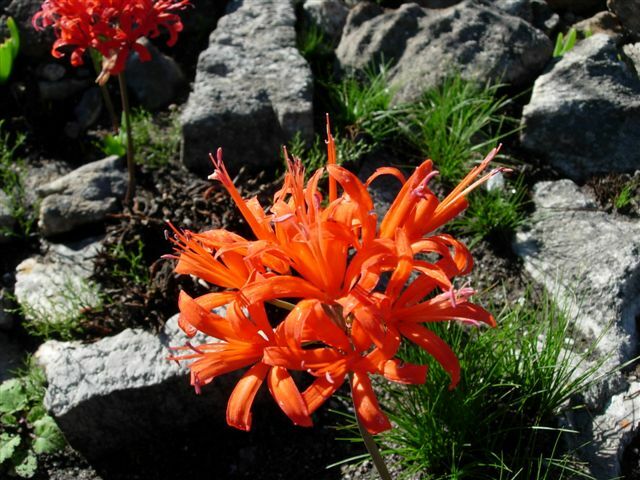 In cultivation, Nerine has been widely hybridized. They are amongst the finest of our autumn flowering bulbs and deservedly popular as cut-flowers, remaining fresh for a long time. 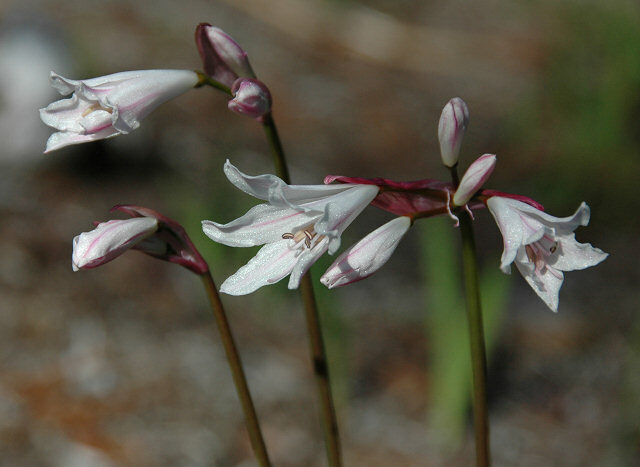 In colder climates, with the exception of the hardy species Nerine bowdenii, these bulbs must be grown under glass as they will not withstand heavy frost on the foliage. The chromosome count for this genus is n=11. Small species don't need deep containers and will survive and flower just fine in 4" (10 cm) pots. However, larger species will require moderate to very deep containers in order to produce good blooming plants. If grown in pots or containers, the sharp draining medium should be composed of fibrous loam, coarse sand/perlite/pumice, well decayed manure/compost and leaf mold. The bulbs of most should be set with the neck just above the soil. Some growers prefer to water them in once, others will leave the bulbs dry until the growing season. However, if bulbs come with roots, they would probably benefit from quick watering. Most species like full sun, but specific conditions are dependent upon species. Divide the bulbs after about 5 years or when flowering performance diminishes due to overcrowding. In a medium with good compost, supplementary nutrients is usually not necessary as it encourages leaf growth in expense of flowers. A low nitrogen, high phosphorous fertilizer can be used very sparingly as phosphorous is very important during flower production. For winter growing species, many growers agree that the bulbs produce better and more flowers if the soil is not kept bone dry. Give the pots a quick watering once or twice during the summer as the weather or container type dictates. Although advantageous, growers should be aware that a bad growing mix and too much water may cause the bulbs to rot. Hamish Sloan suggests watering the bulbs in late July to early August in the northern hemisphere. 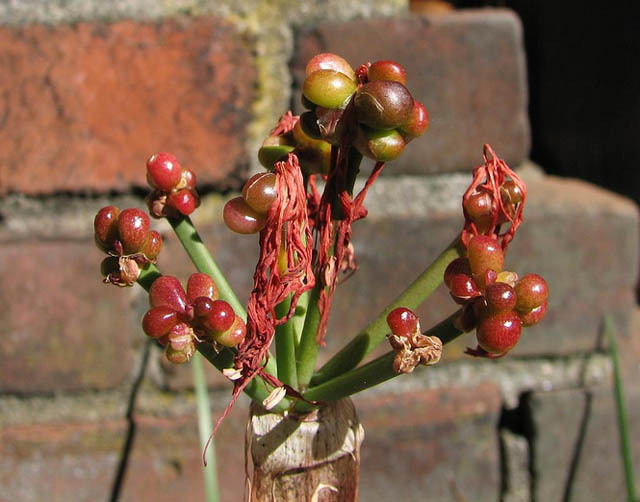 Water moderately once the flower buds appear and resume watering regularly when the leaves appear. Continue to water and fertilize until early summer when the bulbs go dormant. Bill Dijk who gardens in New Zealand keeps his pots completely dry during the summer in the baking sun. However, baking sun is not necessary for good flowering (Hamish Sloan). For summer growing species, water every 10 days or so depending on environmental conditions and type of pots. Water a couple of times during winter dormancy to keep the roots from becoming completely dry. Hardy species like N. bowdenii receiving winter rain in northern California still perform very well. Others require a dryish dormancy to bloom. 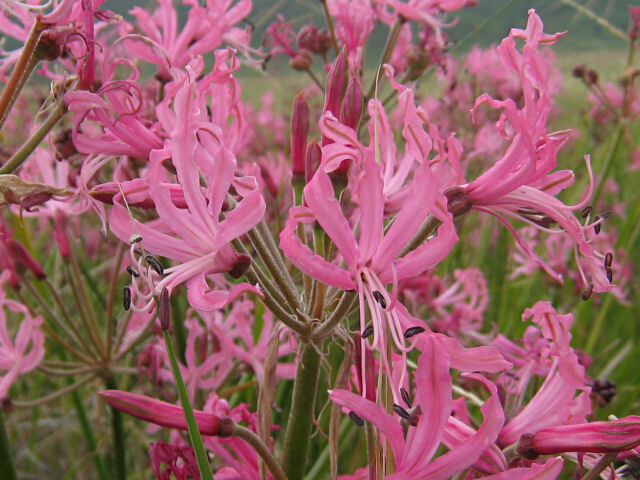 Nerine produce fleshy seeds that are programmed to germinate immediately. Therefore seeds that are ripe (often easily detached from the flowering spike) should be sown right away into a well drained mix. Nerine seeds are best pushed gently into the surface of the soil about 1/4" (1/2 cm), not covered, and watered by capillary action - standing the pot in a saucer until the surface is damp. Germinate rate should be very good, almost 100%. For the first year they can be kept growing through the resting season. After that they will need the normal rest (Peter Smithers). Maturity schedule: N. bowdenii (5-6 years, Mark Mazer), N. sarniensis (4-5 years, Nick de Rothschild). Dwarf species like N. angustifolia, N. filifolia, and N. filamentosa are relatively quick to flower, perhaps 3 years or so (Jim Shields). Photo below of seeds from Nhu Nguyen. 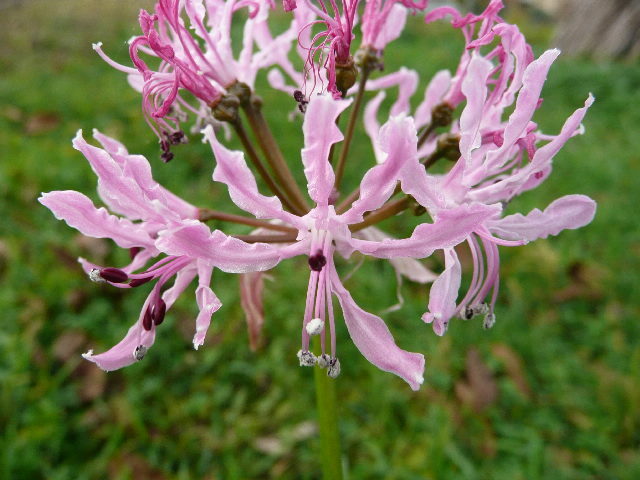 All nerines are highly susceptible to mealy bug infestation. It is also reported that they are susceptible to Narcissus bulb flies. Treat the plants at the start of each growing season with a systemic insecticide such as imidacloprid. Treatment with insecticides will help keep bulbs clean from viruses transmitted by sucking insects. Bulbs purchased from large commercial sources should be quarantined until no signs of viruses appeared. 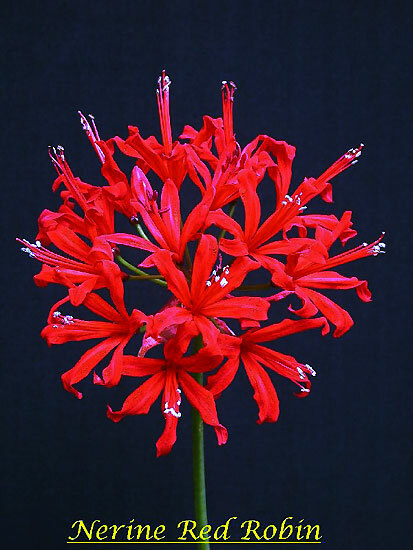 Nerine was the subject of the topic of the week for the Pacific Bulb Society list in April 2003. Hamish Sloan provided an excellent introduction in two parts accessed by the following links: Introduction Part 1 and Introduction Part 2. Also, Graham Duncan's Grow Nerines is a good resource for information about this genus. For photos of some of the hybrids consult the Nerine Hybrids wiki page. For photos of hybrids created by Jack Zinkowski consult the Nerine Zinkowski hybrids page. For information on hybrids between this genus and Amaryllis belladonna see xAmarine. Representatives of some of the species are shown below. or click on the name in the table below.